I love quirky characters in junior novels. They hold the attention of readers who are in that transition from picture books and short stories to more involved novels. They make the increased number of pages seem just a little bit less daunting. What could be more quirky than a small herd of five rare-breed sheep on a mission to bring what they believe is a magic talisman to Lord Aries, the Sheep God. They venture from their home on Eppingham Farm to find Aries ‘in the north’. As The Eppingham Posse of Rare Breed Warriors searches for Aries, they are being followed by bumbling bank thieves Luke and Neil who are trying to retrieve their mobile phone (the mysterious silver talisman) which contains evidence of their crimes and by their owners, Gran and Tod, who simply want their beloved sheep to return home safely. This excellent adventure story is filled with humour, excitement, unlikely heroes and intriguing characters that kids will love. It is the first book in a series, followed by The Warrior Sheep Go West. 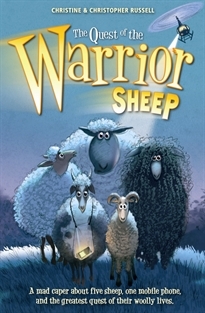 The third book, The Warrior Sheep Down Under, is scheduled for release in 2012.